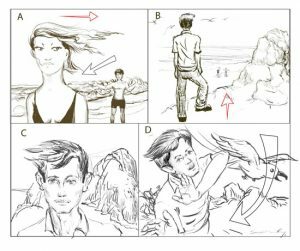 Need to hire a storyboard artist for your screenplay? Looking for the finest and the most creative film storyboard artist for a reasonable rate? We have the finest freelance storyboard artist you need for your film project. Our qualified, trained film storyboard artists will give the best visual form to your screenplay, using the best camera angles and lighting effects. Black and white, or color, our storyboard illustrator service can do it all. Hand drawn, hand or digitally painted. See what your film will look like before shooting it. It is a small investment for a huge benefit in film making. If you find a better storyboard design artist at a cheaper rate elsewhere, please go ahead and hire from them.